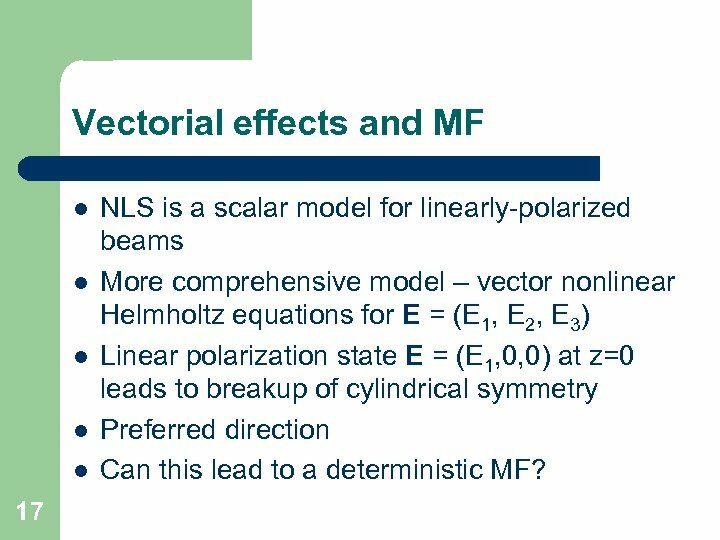 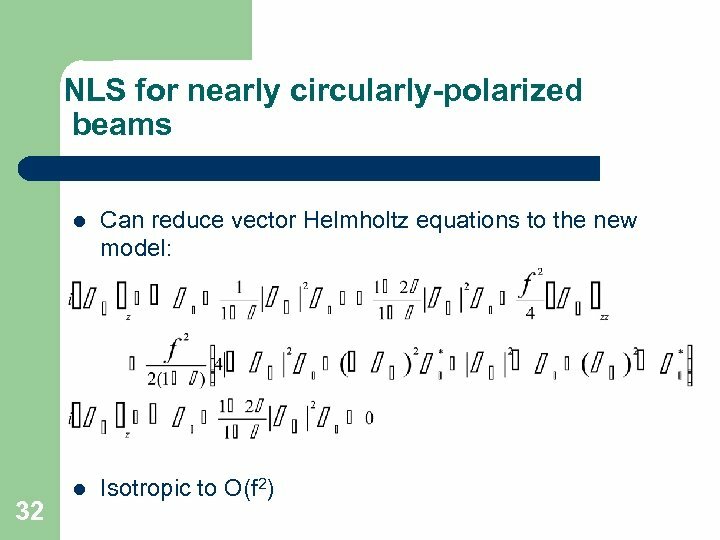 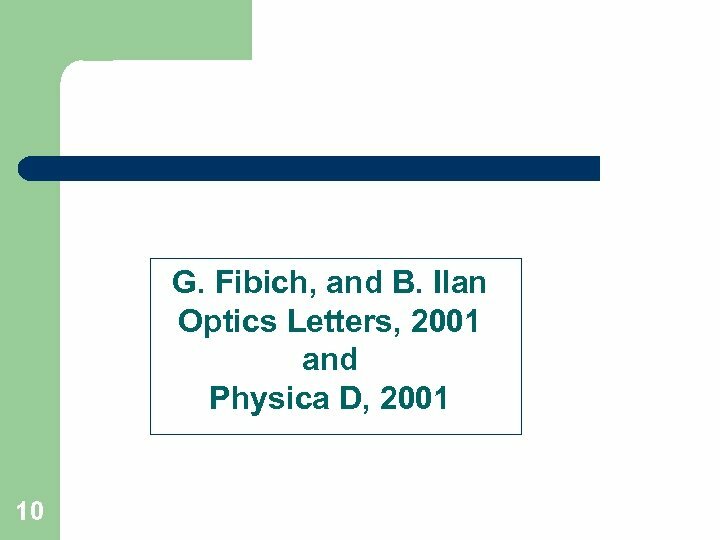 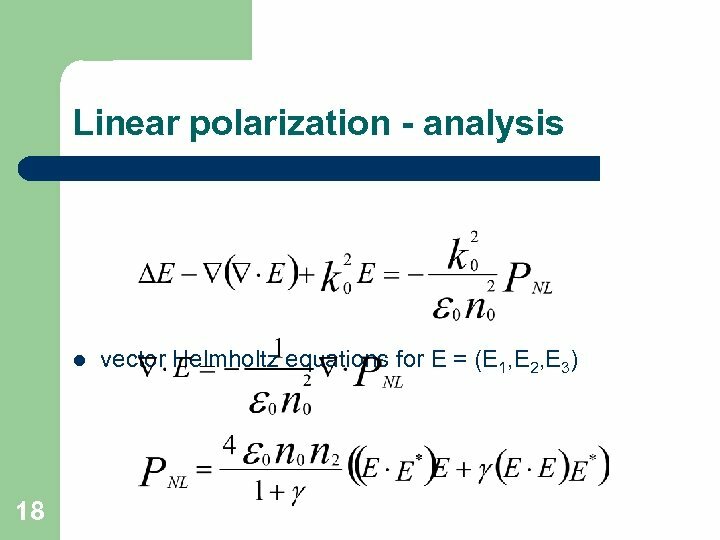 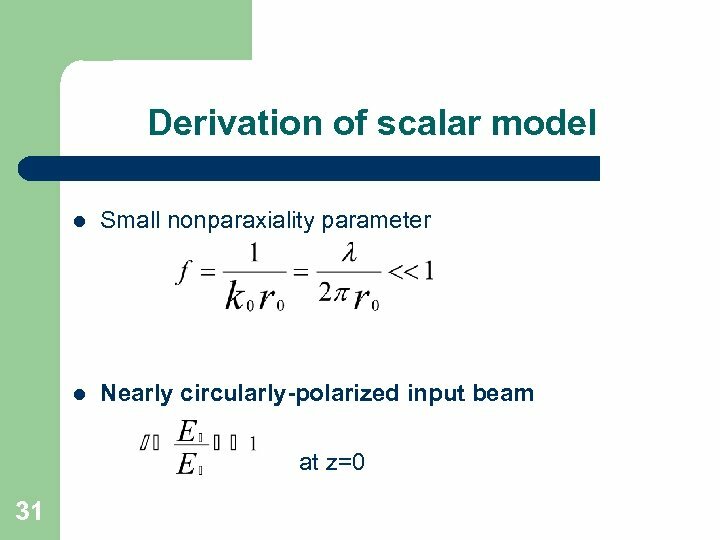 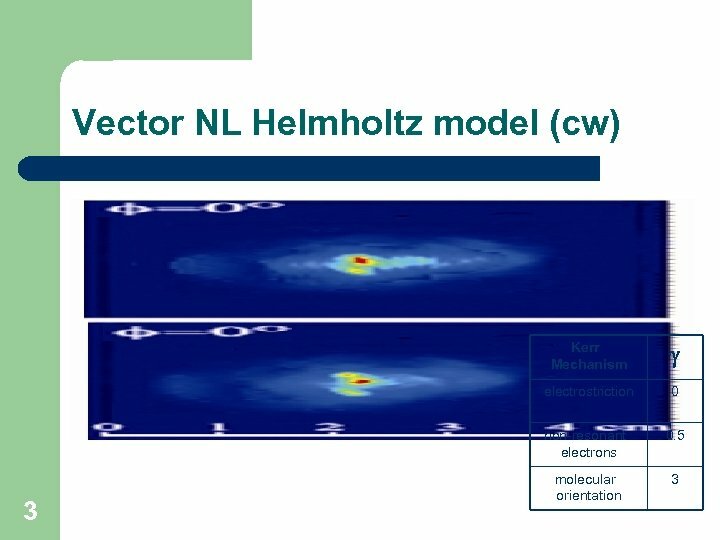 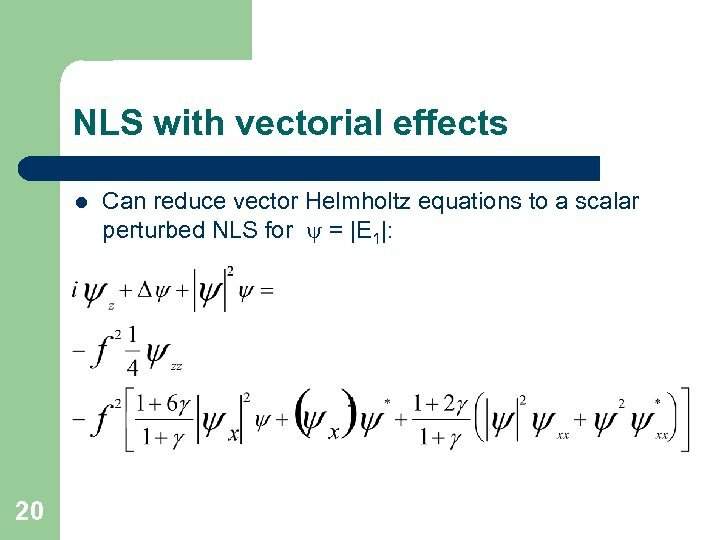 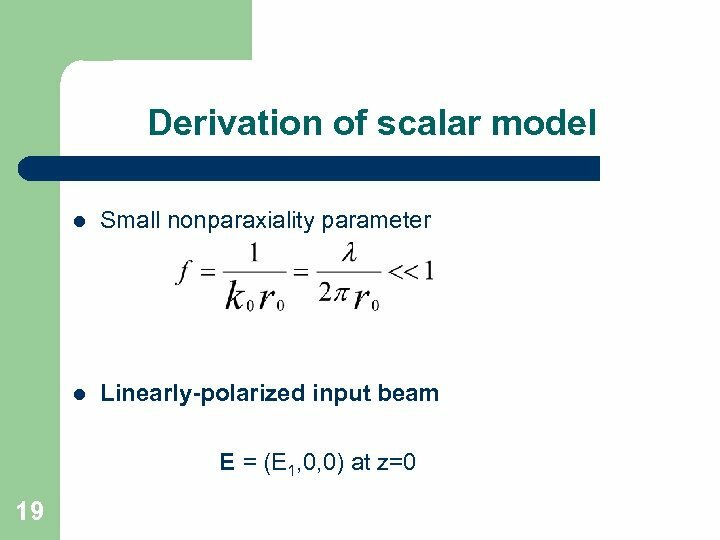 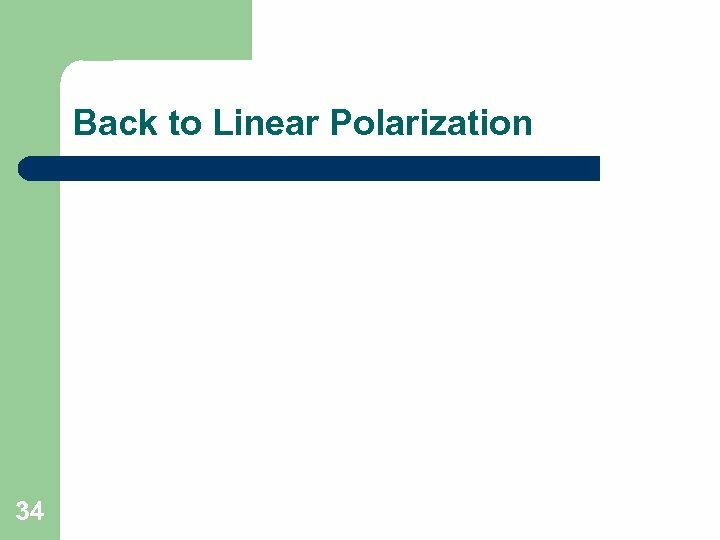 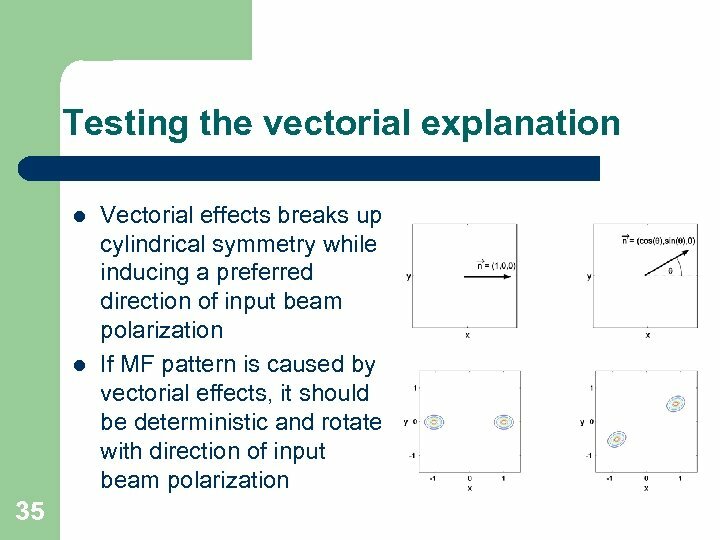 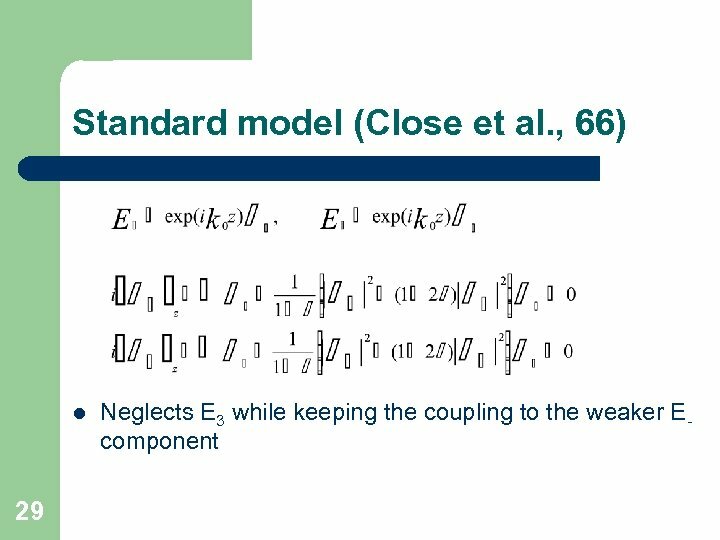 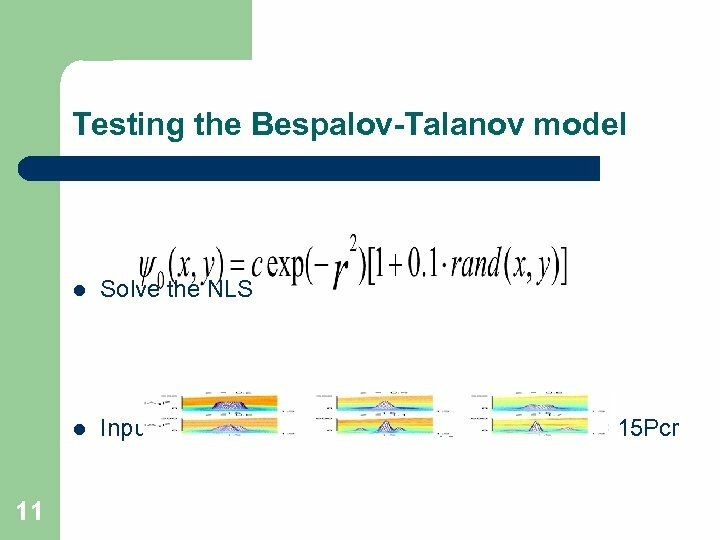 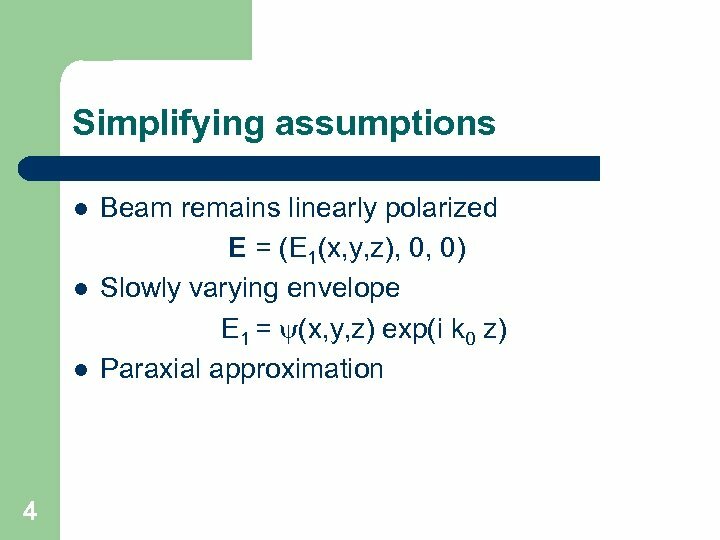 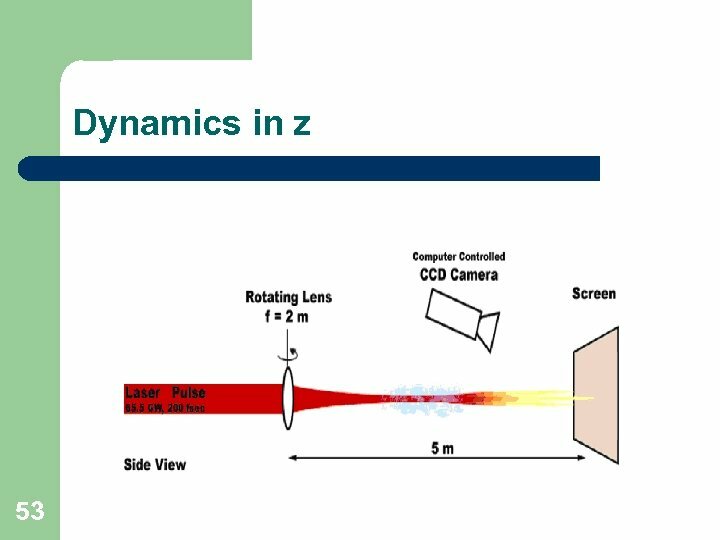 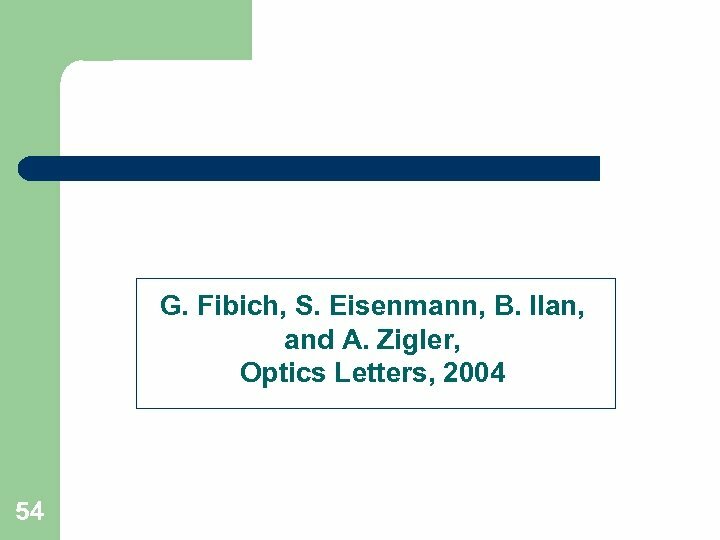 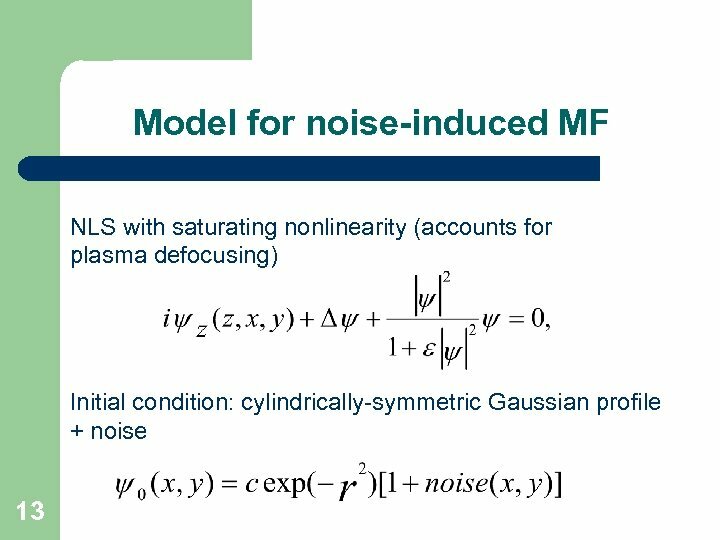 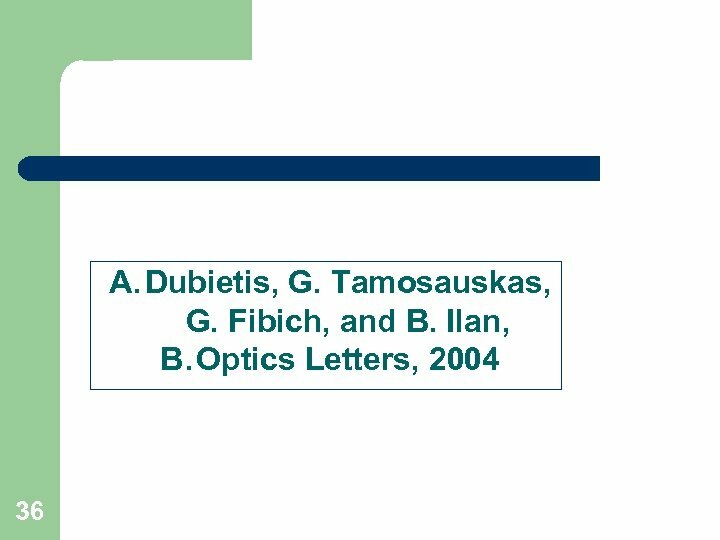 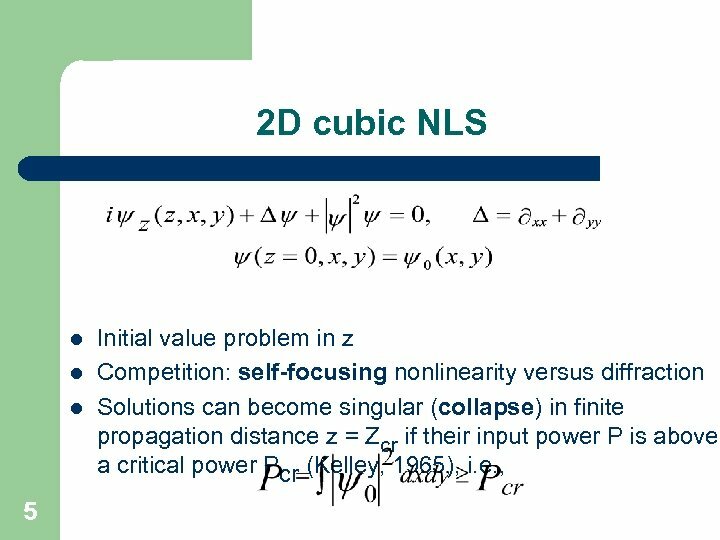 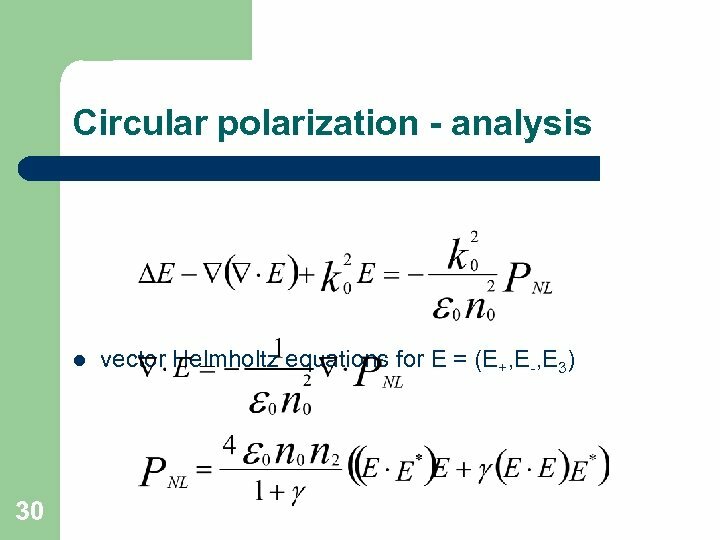 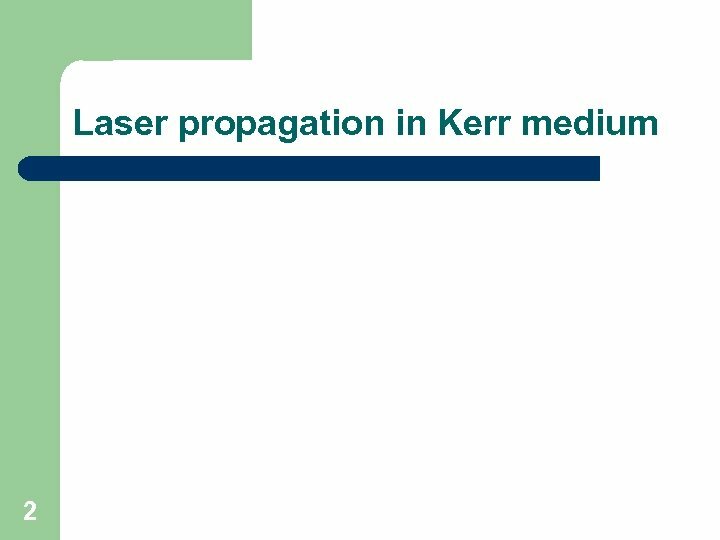 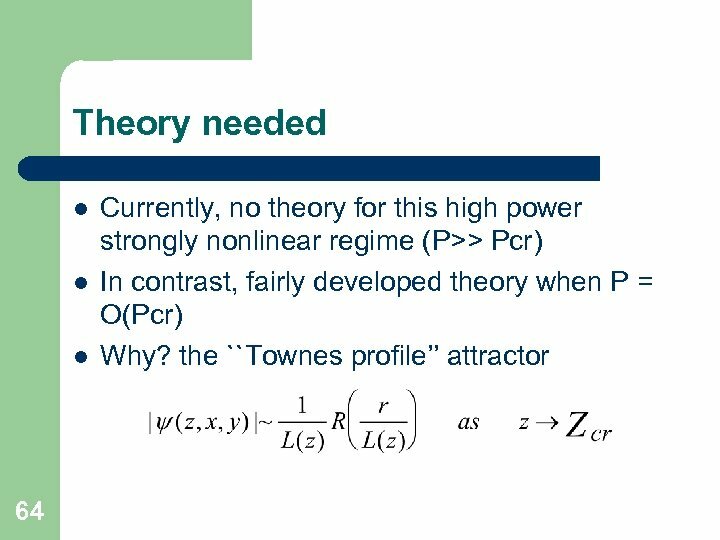 Vectorial effects and MF l l l 17 NLS is a scalar model for linearly-polarized beams More comprehensive model – vector nonlinear Helmholtz equations for E = (E 1, E 2, E 3) Linear polarization state E = (E 1, 0, 0) at z=0 leads to breakup of cylindrical symmetry Preferred direction Can this lead to a deterministic MF? 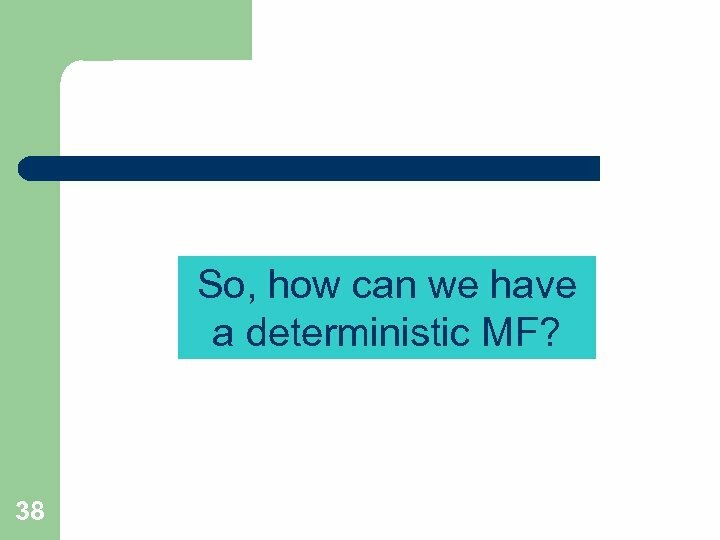 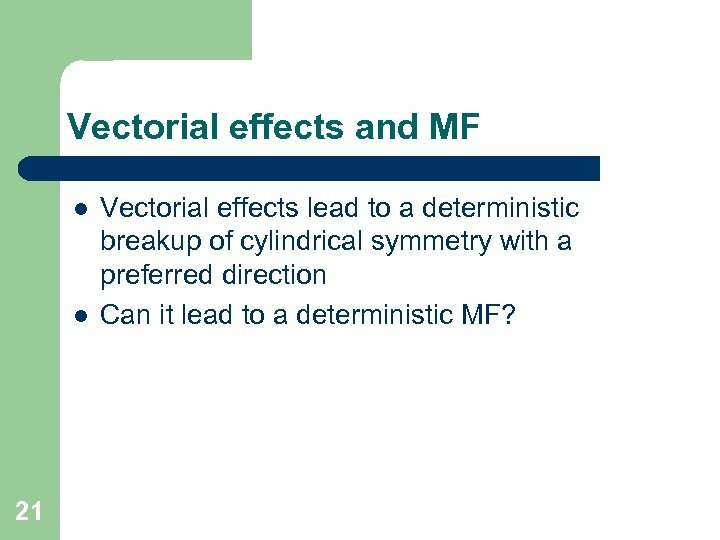 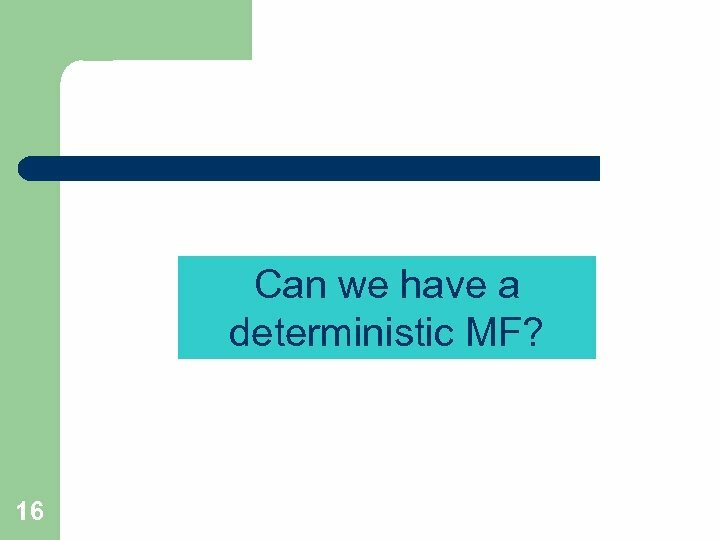 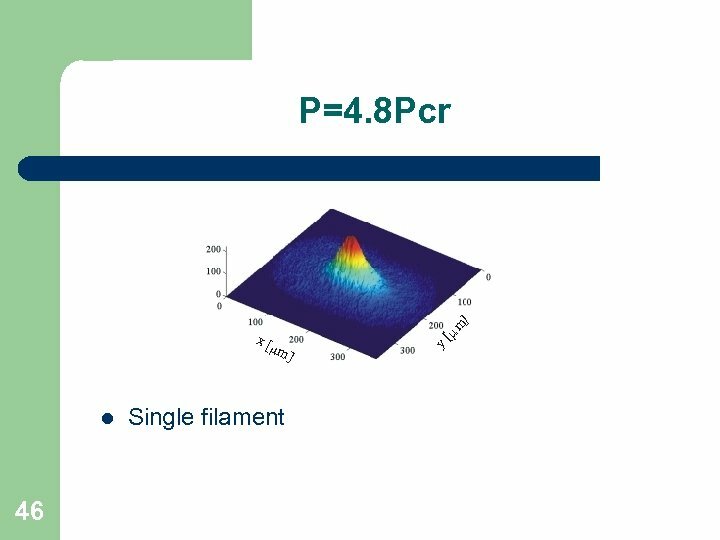 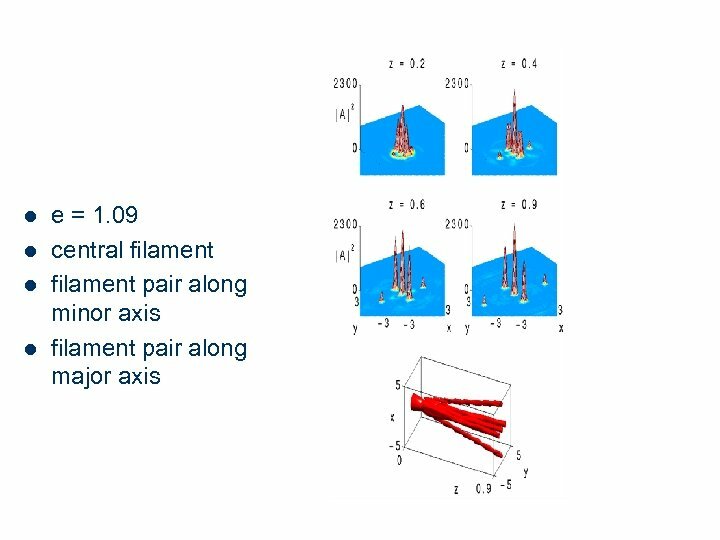 Vectorial effects and MF l l 21 Vectorial effects lead to a deterministic breakup of cylindrical symmetry with a preferred direction Can it lead to a deterministic MF? 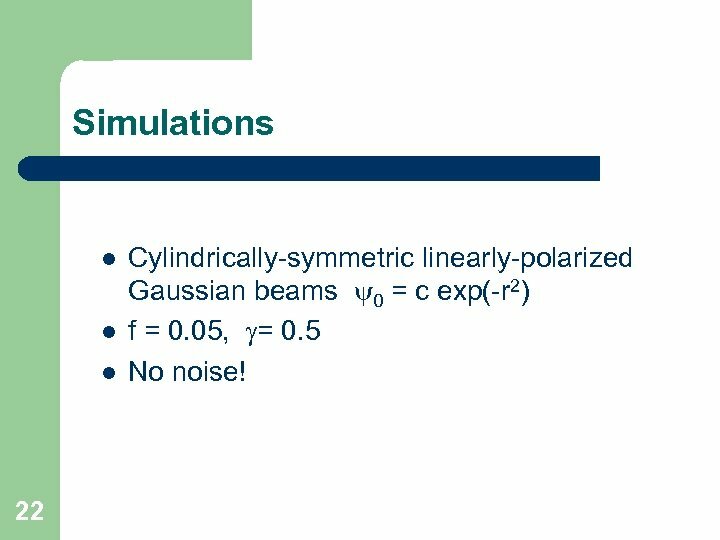 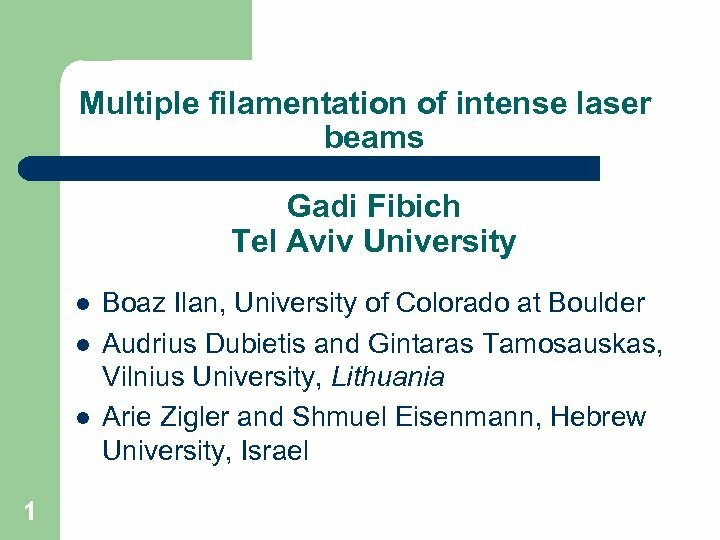 Simulations l l l 22 Cylindrically-symmetric linearly-polarized Gaussian beams 0 = c exp(-r 2) f = 0. 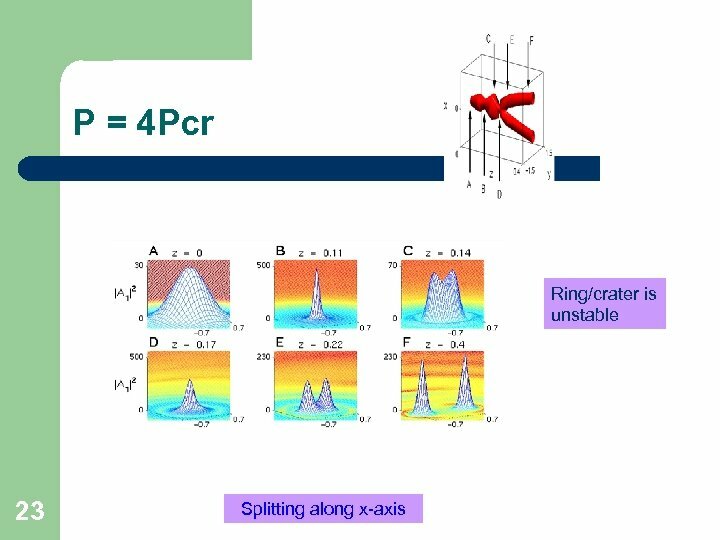 05, = 0. 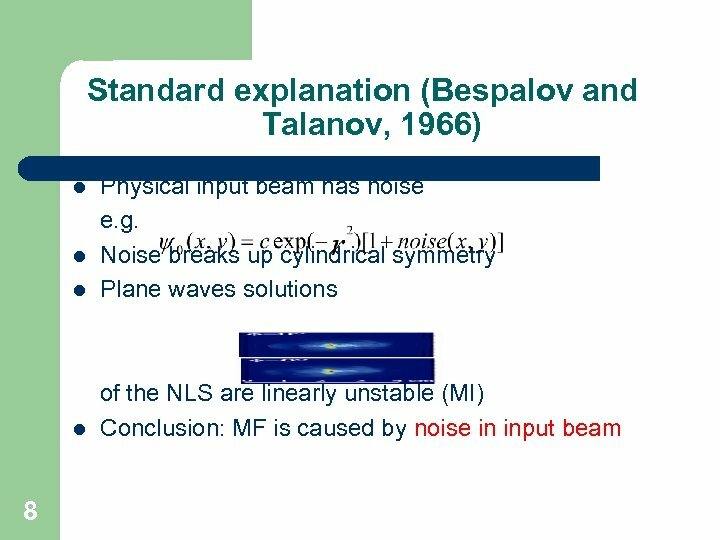 5 No noise! 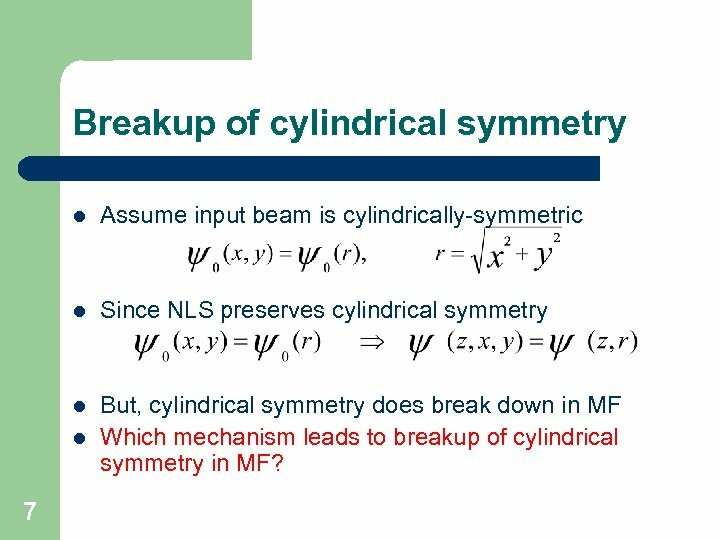 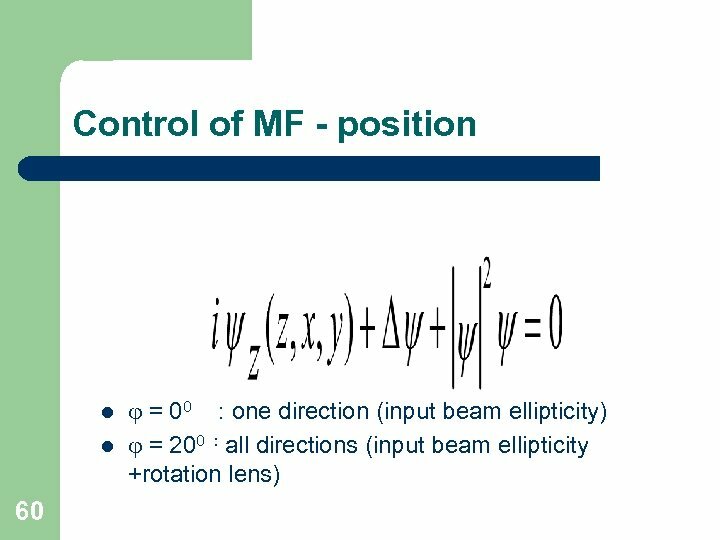 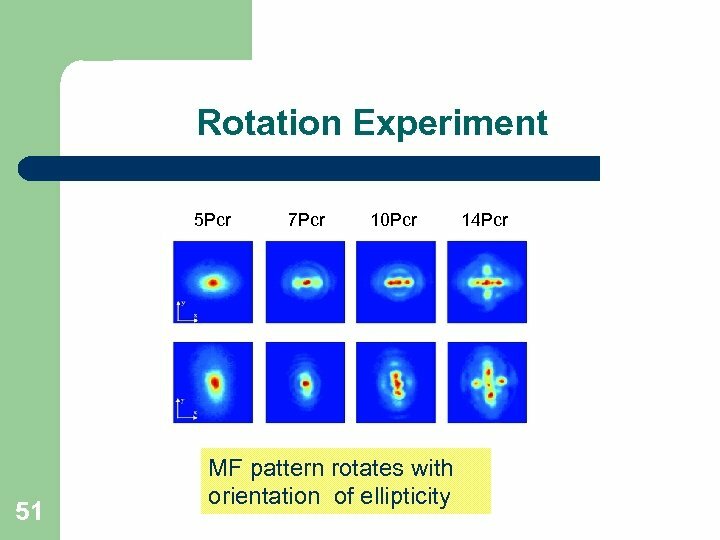 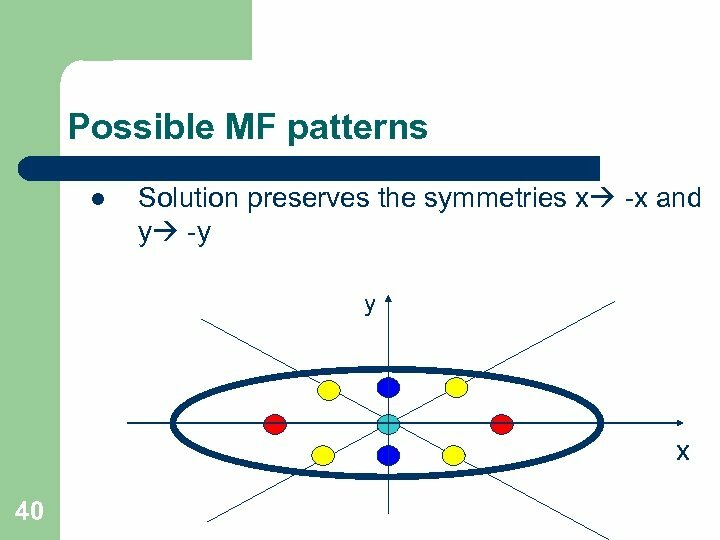 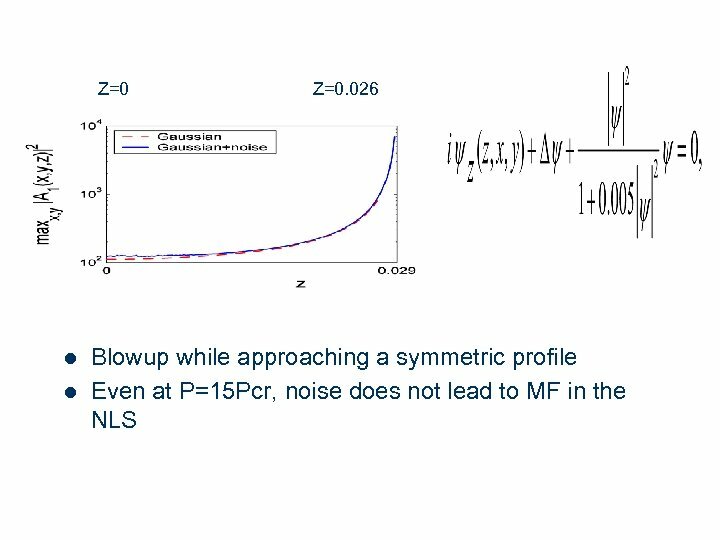 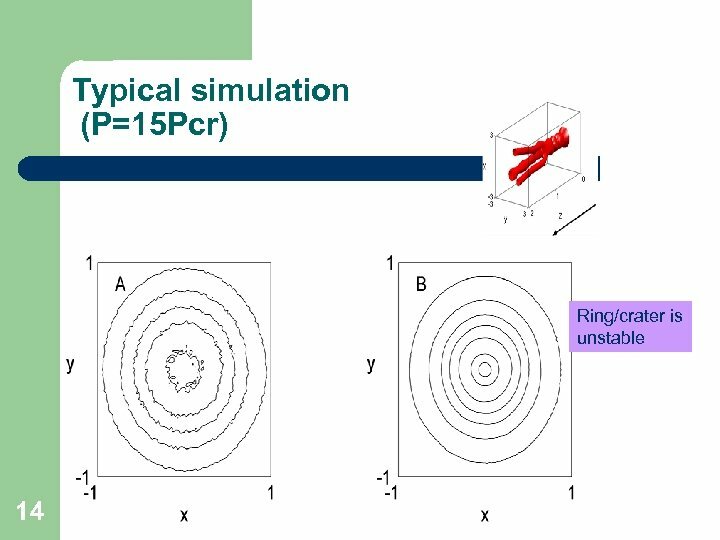 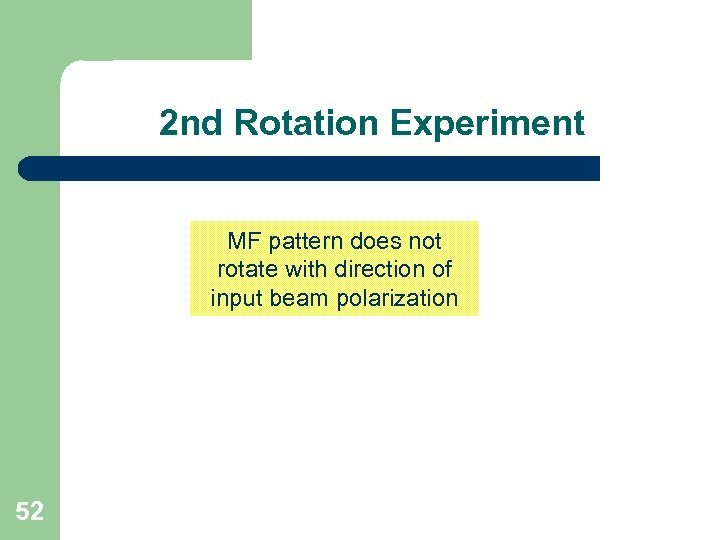 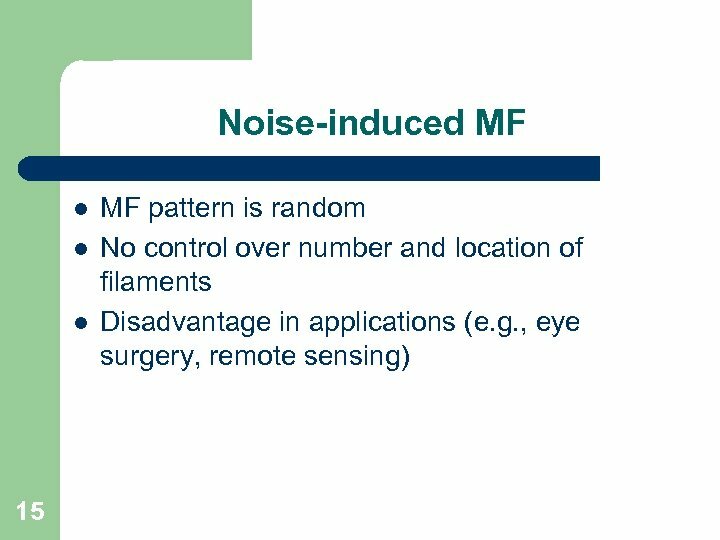 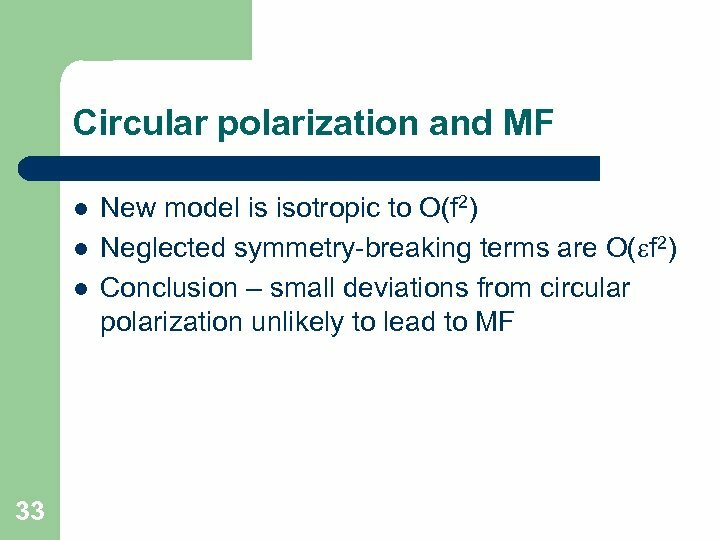 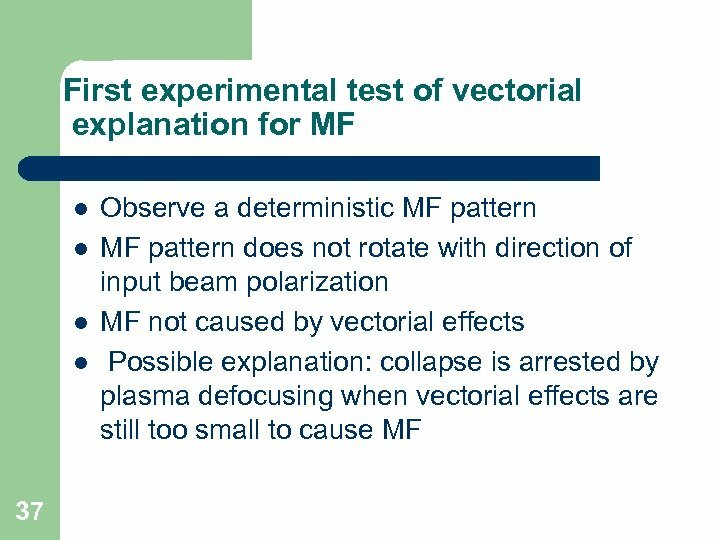 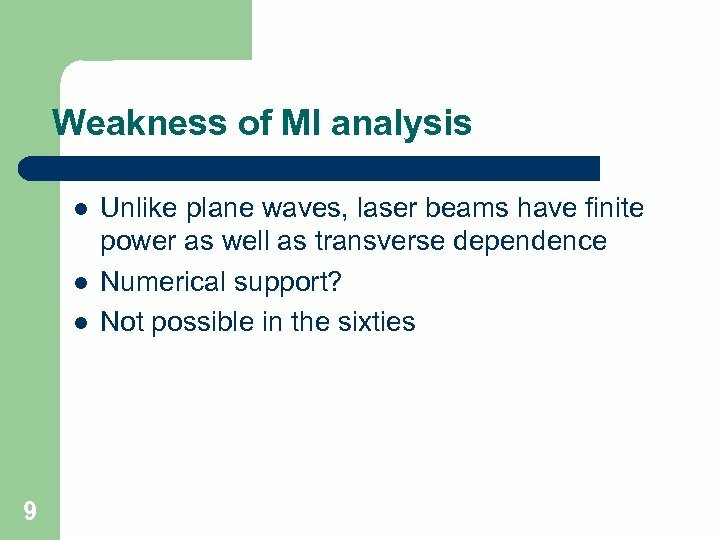 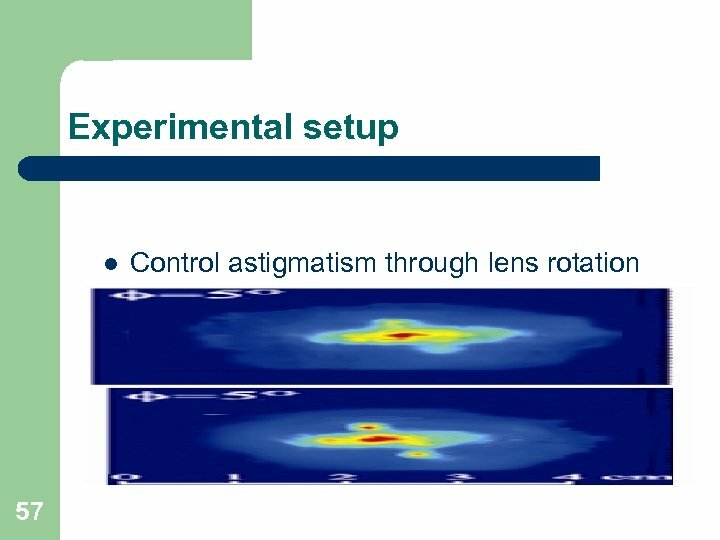 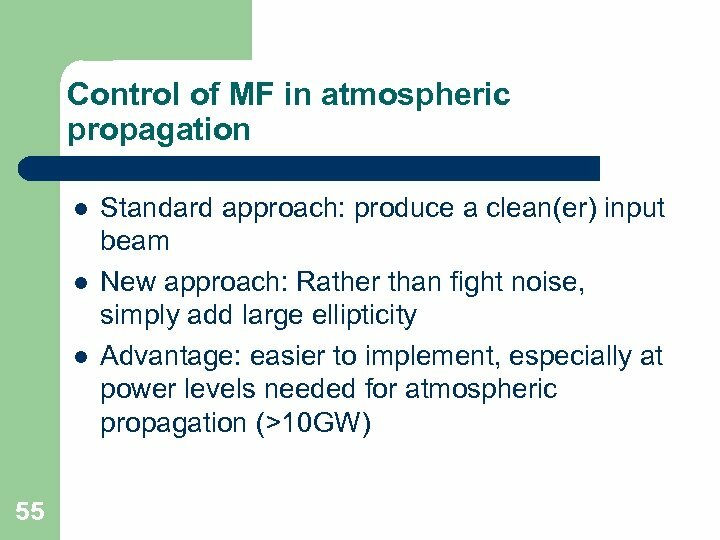 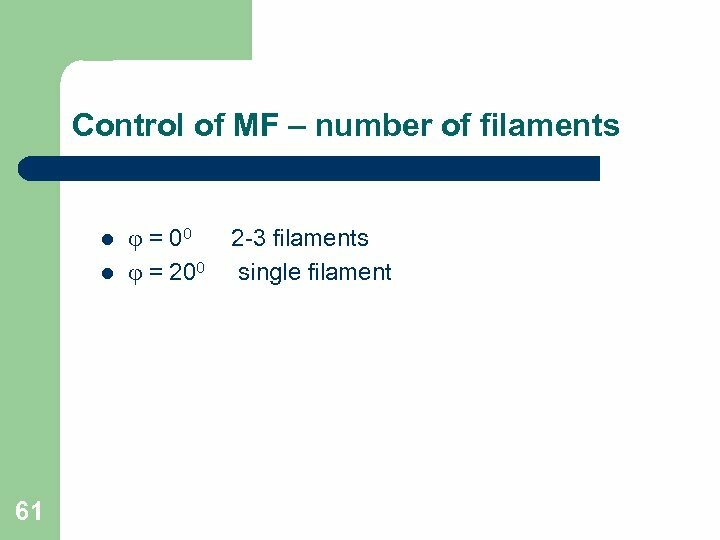 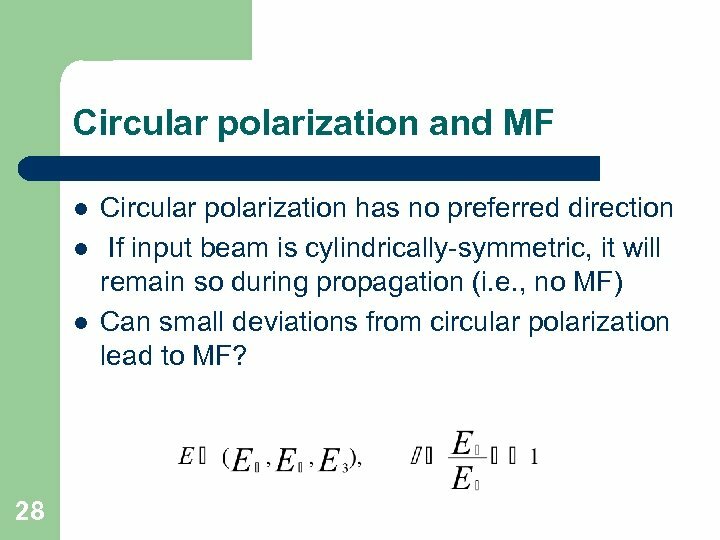 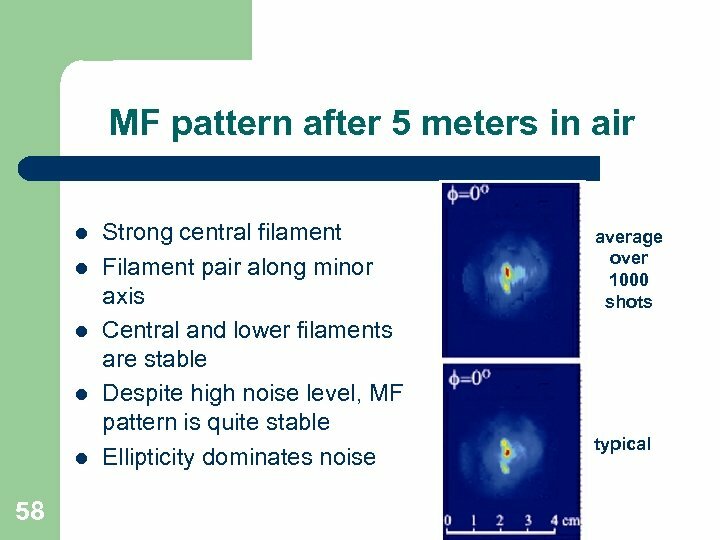 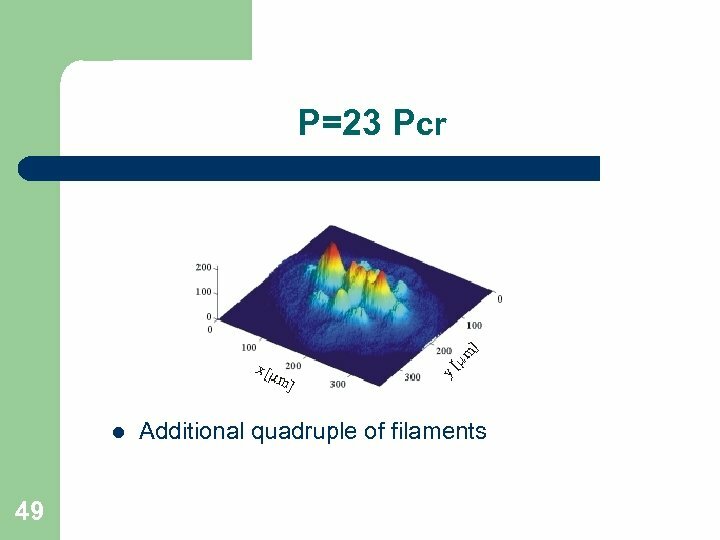 Circular polarization and MF l l l 28 Circular polarization has no preferred direction If input beam is cylindrically-symmetric, it will remain so during propagation (i. e. , no MF) Can small deviations from circular polarization lead to MF? 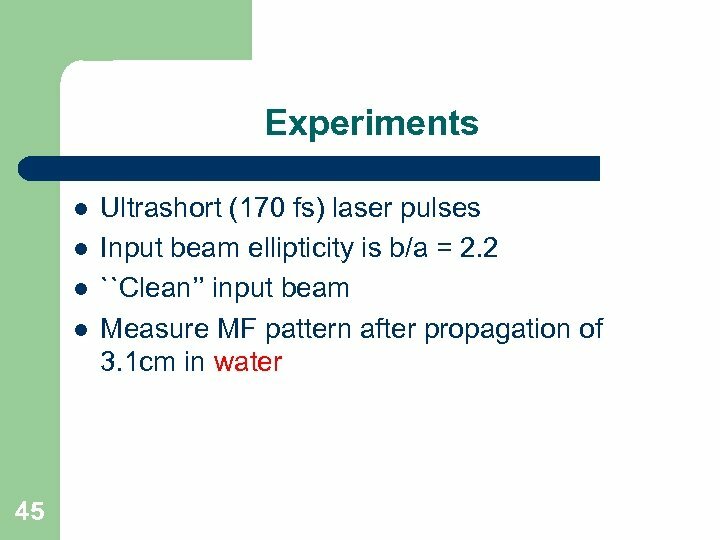 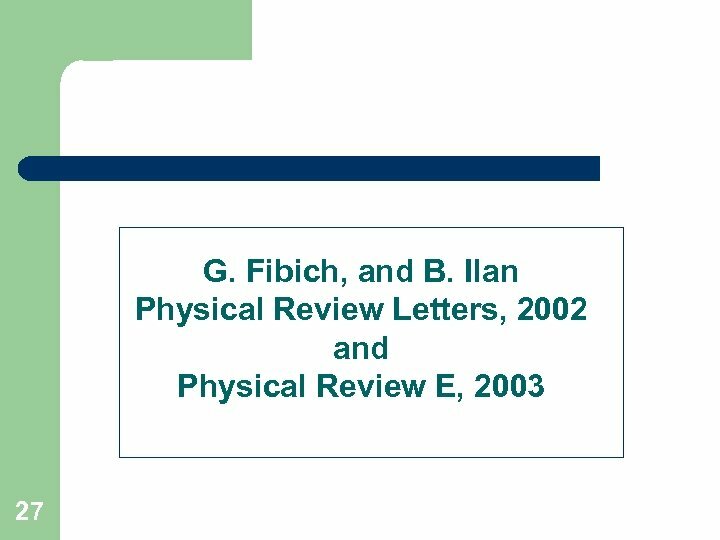 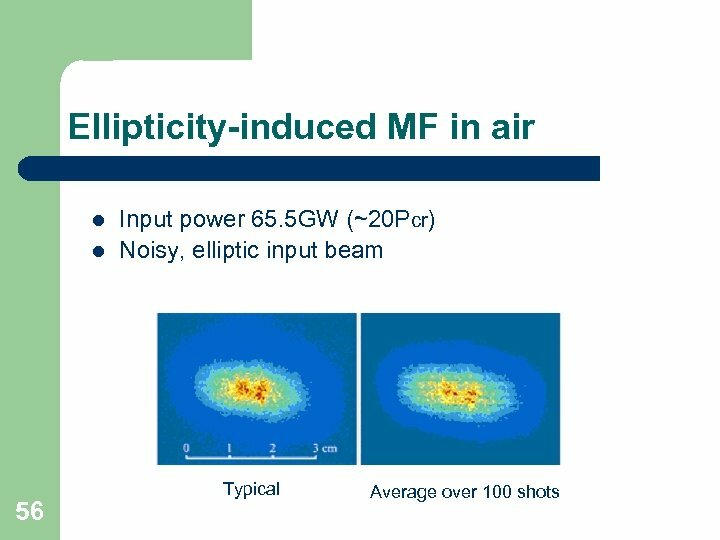 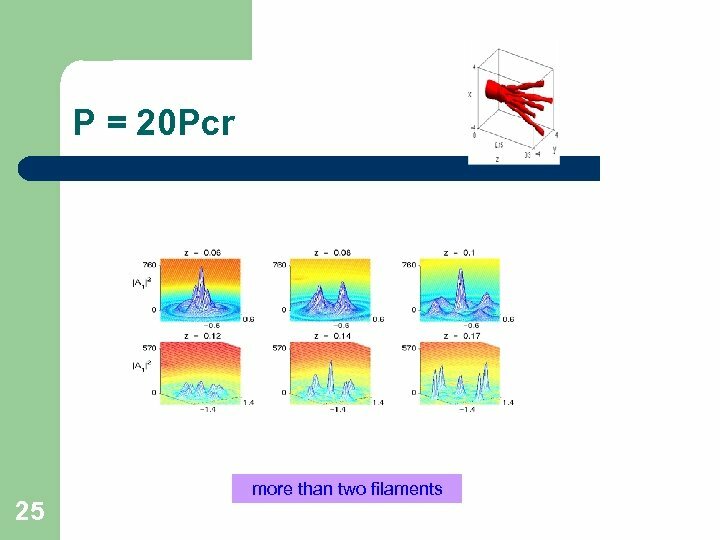 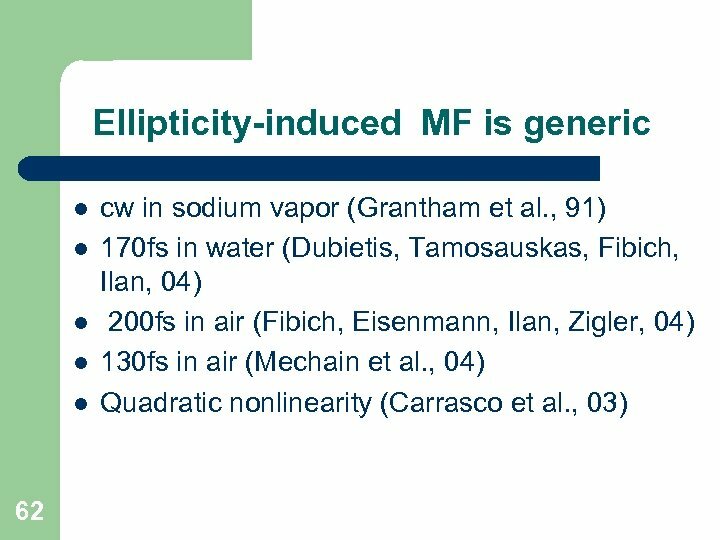 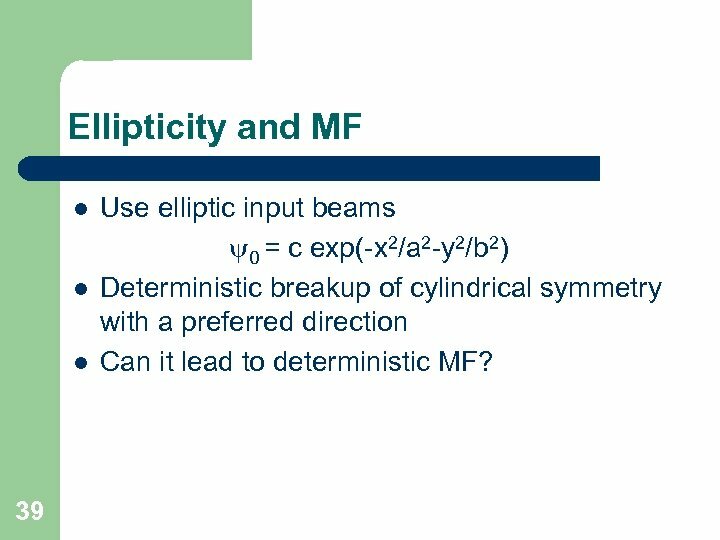 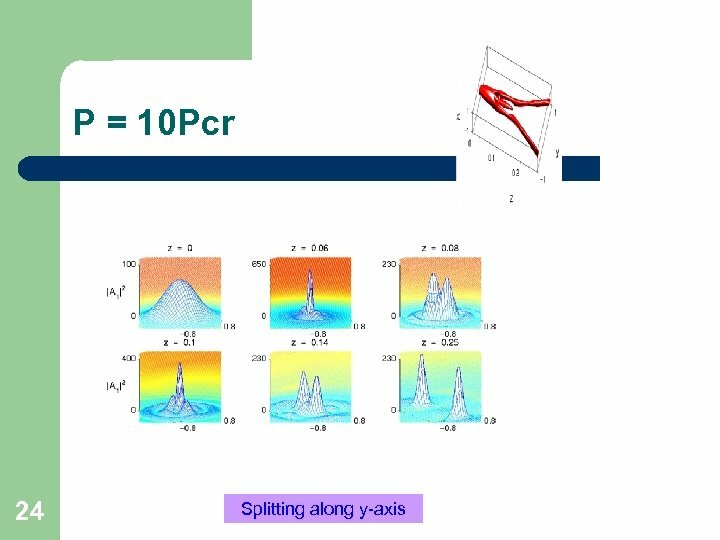 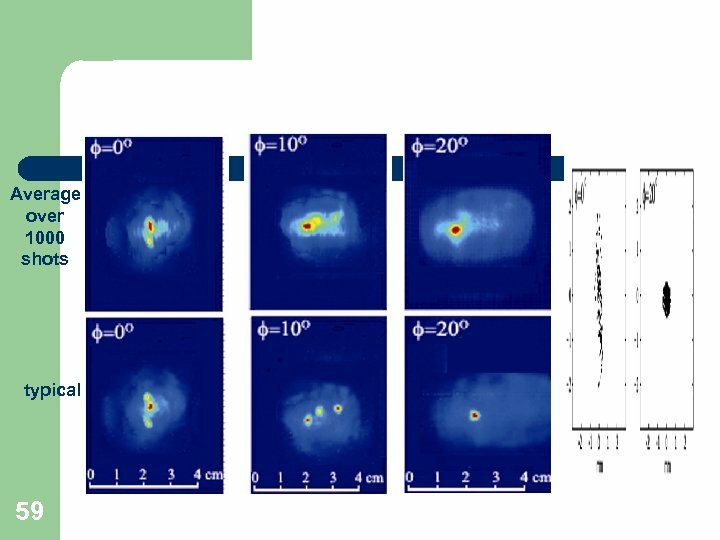 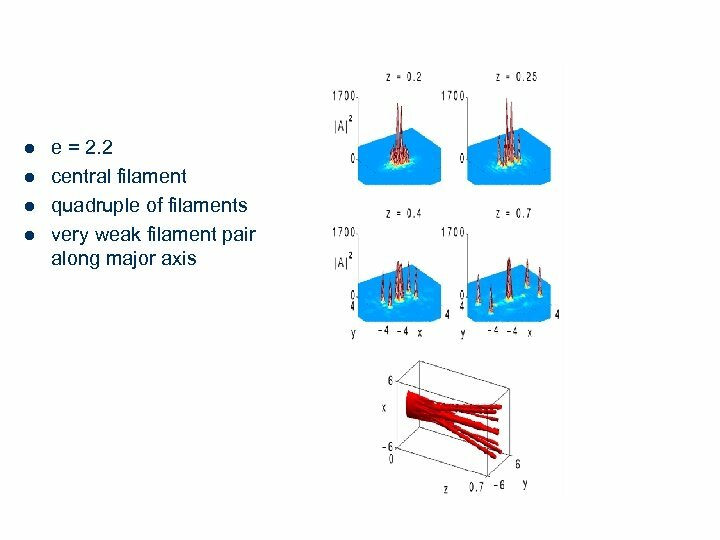 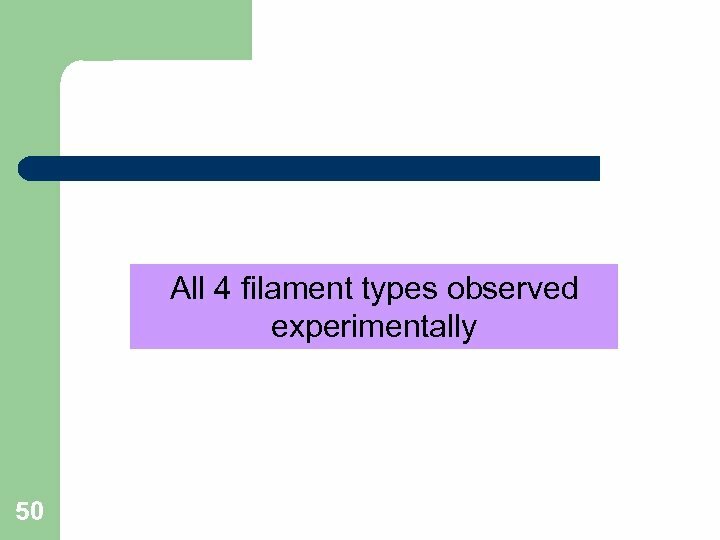 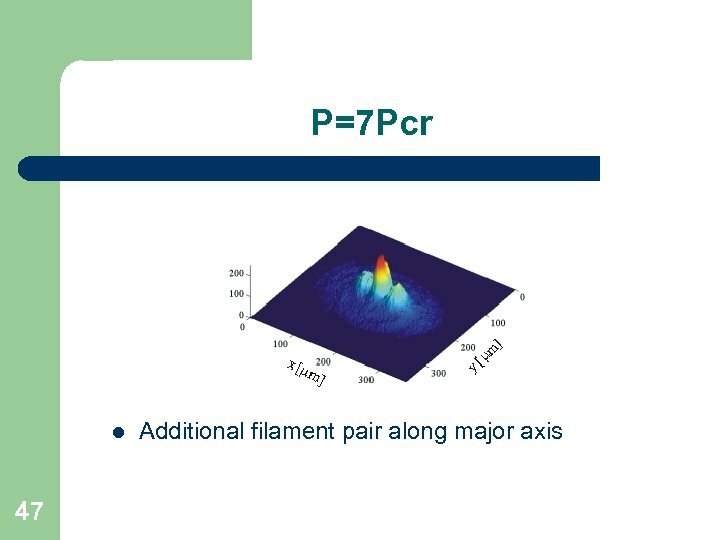 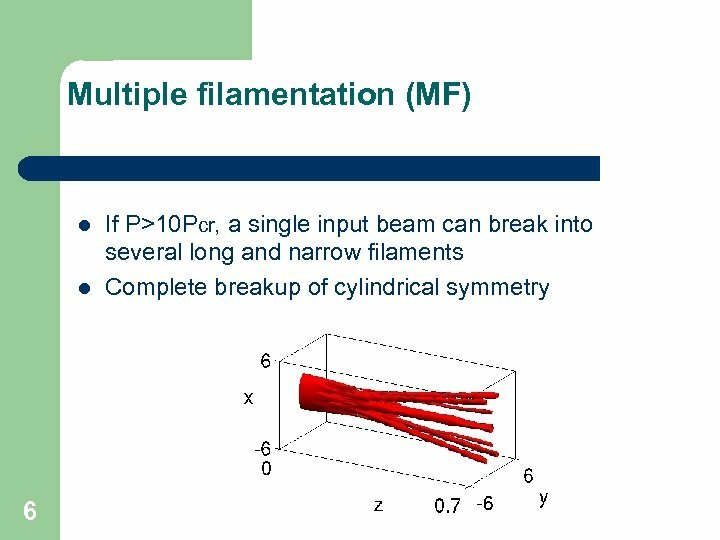 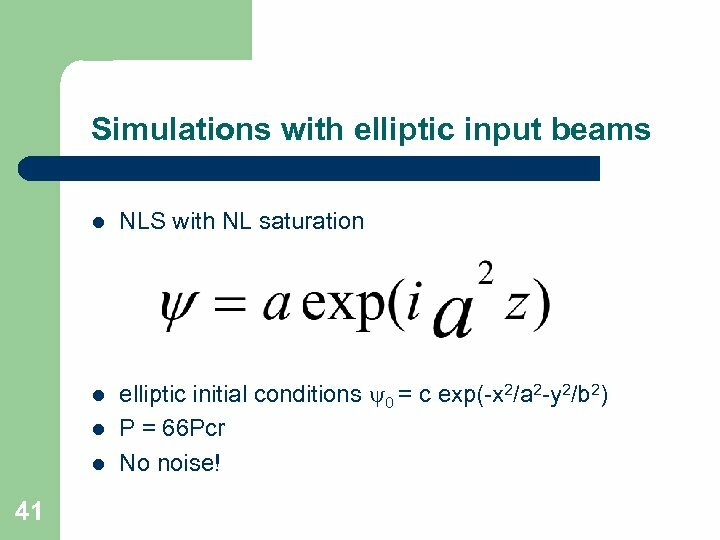 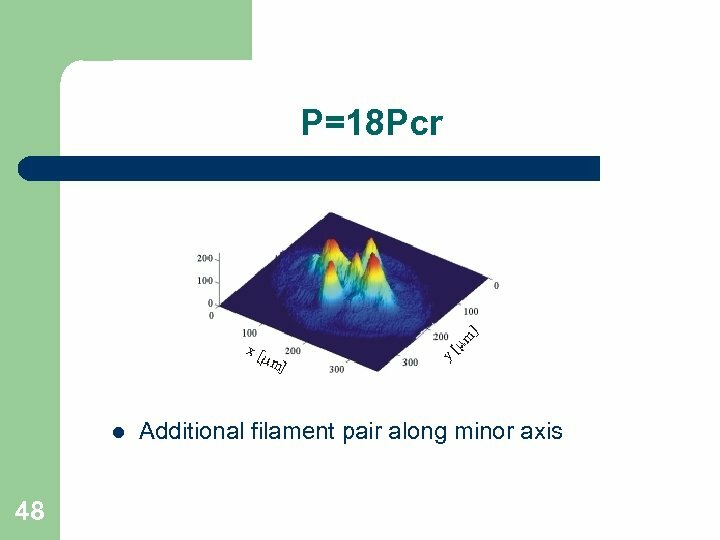 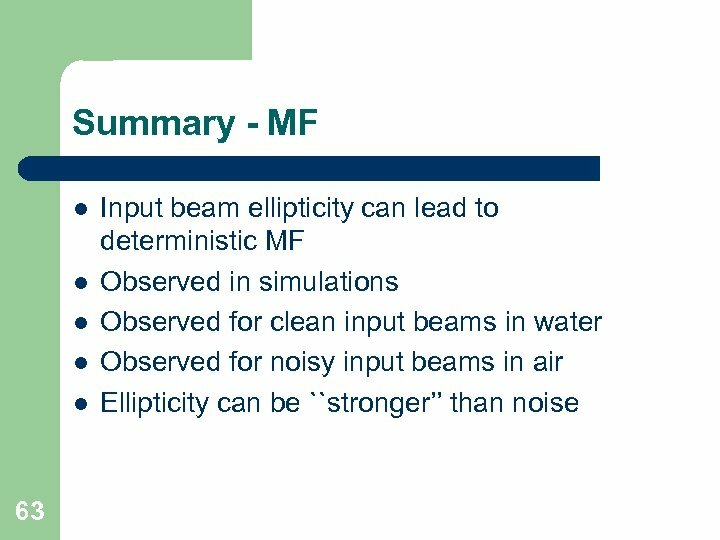 Ellipticity and MF l l l 39 Use elliptic input beams 0 = c exp(-x 2/a 2 -y 2/b 2) Deterministic breakup of cylindrical symmetry with a preferred direction Can it lead to deterministic MF?